James McMillan Snr was born in Auldgirth, Dumfries-shire, Scotland in 1823. He was the youngest of the three known sons of James McMillan; Samuel (1809-1868), Hugh (1815-1866) and James. Sadly we know nothing of James' early life, but by 1851 he was living at 22 South Street, South Petherton, where he was a draper and tea dealer, living with his wife Sarah Ann (b1825, Moolham, South Petherton). James and Sarah were to have four children born in South Petherton and a further three born in Yeovil; James Jnr (1853-1926), John (b1855), Elizabeth (b1857), William (b1859) and then Annie (b1861), Ellen Mary (1862-1945) and Sarah (b1864). In the 1861 census 38-year old James Snr and his family were living in Commercial Buildings (see Gallery) in Lower Middle Street where James Snr had his shop premises. He gave his occupation as a draper and tea dealer. By 1871 the family had moved to Kingston. James Snr was now a travelling draper while his sons James Jnr and John, aged 18 and 16 respectively, were both draper's apprentices. The family, now only James Snr, Sarah and son William, were listed at their home in 27 Kingston, together with a domestic servant, in the 1881 census. Both James Snr and 22-year old William listed their occupations as "Travelling Draper (Hawker)". James McMillan Senior died in Yeovil in the spring of 1909. He was aged 86. 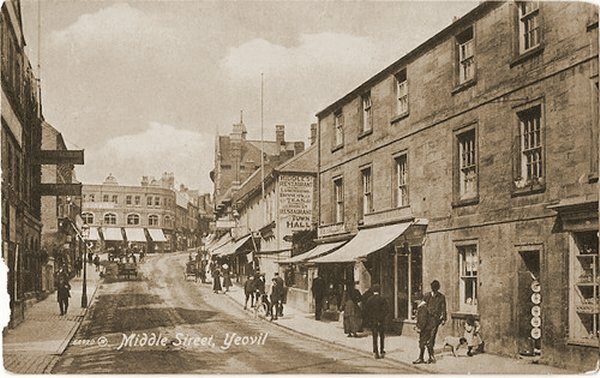 By 1881 James Jnr had left Yeovil and was gaining experience as a draper's assistant (one of nine) in the premises of John Henry Holloway, Mayor of Wells and a draper employing 53 people at 17 to 23 Market Place, Wells. By 1891 some of the children had returned home - James Jnr, Ellen and Sarah. James Snr and William were both still travelling drapers, James Jnr, now aged 38, was working as a draper in his own right and 26-year old Sarah was listed as a draper's assistant - she worked as James Jnr's assistant. 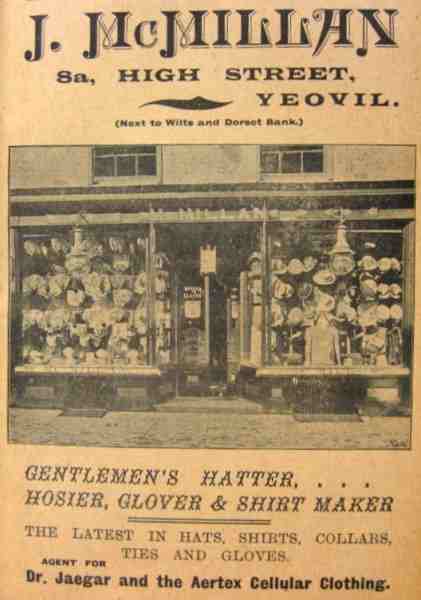 In fact James Jnr had returned to Yeovil in the late 1880s and in 1890 he opened his own shop premises at 8a High Street (see Gallery), described below from the 1891 edition of 'Where to Buy'. "What a pretty thing man is, when he goes in doublet and hose, and leaves off his wit." — Much Ado About Nothing (Shakespeare). It may be as Shakespeare says, or rather makes Don Pedro say, but it is doubtful if the "doublet and hose" of his day were as well calculated to show the graceful proportions of the human frame, or to afford as much comfort to the wearer as the best class of modern hosiery. Not that all modern hosiery is to be relied on, and in making selections we should deal only with houses where the well-known integrity and high character of the proprietor affords a guarantee as to the reliability of the goods. 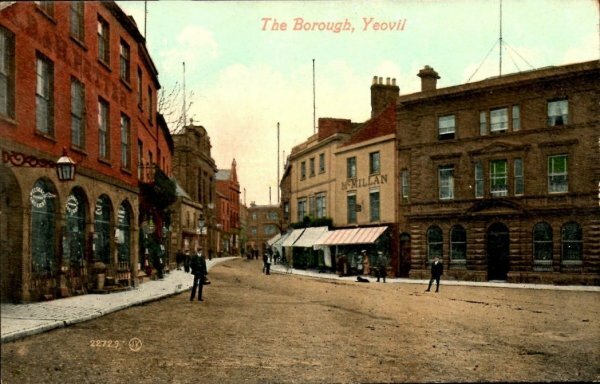 In this respect, Mr J McMillan, Jnr., gentlemen's hosier, etc., of High Street, enjoys a well deserved repute among the public of the district around Yeovil. Mr McMillan, although only twelve months established in his present site, has had a long and valuable experience, and is thoroughly conversant with the trade in all its branches, his extensive knowledge of the wholesale markets enabling him to secure the best goods from the leading manufacturers on the most advantageous terms. The prices throughout are extremely moderate, while the goods are of a superior class. The premises are in the very centre of the town, and the handsome double fronted plate-glass show windows are very attractive. The stock is valuable, and includes hose, pants, and undervests in cotton, merino, cashmere, gauze, and natural wool; Scotch hand-knitted wool hose and half hose (very soft, comfortable, and durable), Lincoln and Bennett's, and Christy's hats in all the latest shapes, and caps for travelling, shooting, and athletes, ties, collars, cuffs, braces, handkerchiefs, dress, longcloth and flannel shirts (remarkable for their superior finish and comfortable shapes), and all kinds of travelling necessaries, such as Inverness capes, riding and driving aprons, portmanteaus, hat cases, umbrellas and similar goods in the latest and most fashionable designs, while a leading house like this, in the ancient gloving centre, has naturally a rare selection of the best qualities of gloves for every purpose and in the best makes. Intending purchasers have every facility for making their selections, and the business is conducted under the personal supervision of Mr McMillan, who is also sole agent in the locality for the "Cellular" Clothing Co., Ltd.
James almost always advertised himself as "J McMillan Jnr" even though it appears that his father, James Snr, didn't have shop premises but was still active as a travelling draper. 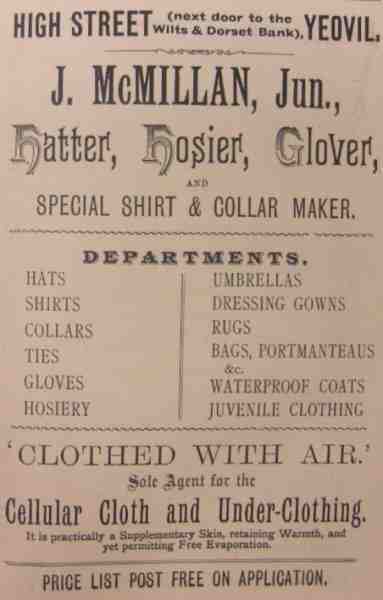 James Jnr was listed as "J McMillan Jnr, Gentlemen's Hosier, Hatter, Glover and Shirtmaker of High Street" in the 1895 edition of Where To Buy, as a "Hatter, Hosier, Glover of High Street" in both Whitby's Yeovil Almanack Advertiser of 1895 and the 1896 edition of the Western Gazette Almanac. Whitby's editions of 1898 and 1903 listed him as "James McMillan Jnr, Gent's Outfitter of 8a High Street" and finally Collins' Yeovil Directory of 1907 listed simply as a hosier of High Street. By the time of the 1911 census his parents had both died and James Jnr, now aged 58, and his unmarried sisters Annie, Ellen and Sarah - aged 50, 48 and 46 respectively - together with a domestic servant, all lived at 4 Kingston. James gave his occupation as a hatter and hosier while all three of his sisters were living by 'private means'. James McMillan died in Yeovil in the spring of 1926, aged 73. A postcard of around 1912 of Lower Middle Street looking towards the Triangle. The building at right was Commercial Buildings where James Snr had his shop premises and the family lived in the accommodation over. All the buildings at right were demolished for the Glovers Walk shopping precinct project of the 1960s. James Junior's first advertisement in the 1890 edition of Whitby's Yeovil Almanack Advertiser. This advertisement, from a later edition of Whitby's Yeovil Almanack Advertiser, is one of the rare occasions that James didn't advertise himself as James McMillan Junior. A heavily hand-tinted postcard of the Borough and High Street dating to about 1907. James McMillan Jnr's shop premises are seen at centre. 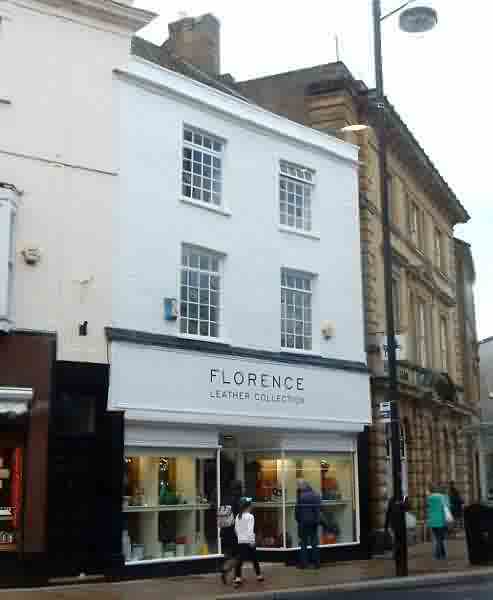 Formerly the premises of James McMillan Junior, 8a High Street photographed in 2017. It was vacant again by mid-2018.